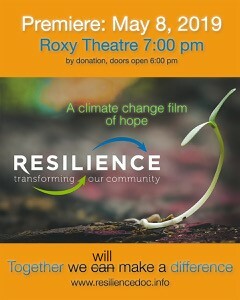 Resilience: Transforming our Community – A different kind of climate change film. This is an open invitation to attend & it is a pay-what-you-can event. The screening will be followed by a question & answer session. When it comes to climate change, half of Canadians feel overwhelmed and don’t know what to do. Resilience: Transforming our Community makes this global crisis a personal issue, right in our own backyard. With a message around action and working together, the viewer moves from feelings of unease about the future to empowerment in community-based change and hope as they learn that each of us has a role to play in transforming our community. deal with despair. If we wait for governments, it will be too late. If we act individually, it won’t be enough. But if we work together, it might just be enough, in time.